to enable organizations with mapping data to contribute their data to Google Maps and Google Earth. This program, like those we've introduced for other map content types, offers organizations with mapping data -- and an interest in making it more visible and useful to internet users -- a straightforward process for adding this data to Google's services. We now provide specifications on the types and formats of base map or "vector" data we welcome, including new roads, housing developments, parcel data, points of interest and bike trails. We hope that organizations with mapping data, such as local governments, regional GIS consortia or real estate developers, will take this opportunity to improve and enrich our base map for their community. If the opportunity is of interest to you, tell us about your organization and your data. If you don't have large datasets to provide, but do have edits to the map to suggest, then try our tool for easily suggesting edits. 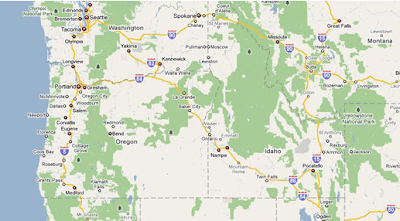 Today we released new base map data for the U.S. in Google Maps, Google Earth and other Google services. We developed this map by integrating data from many sources, including datasets provided by government agencies and other organizations with an interest in making their mapping data widely available. One such organization is the USDA Forest Service, which provides comprehensive and detailed data for all of the national forests within the U.S. Using this dataset, we've been able to show the boundaries of U.S. National Forest-managed forests and grasslands in our base map, making these lands more visible in Google Maps. We've also used Forest Service data to improve roads and trails on these public lands. "An important part of the mission of the USDA Forest Service is informing the public about the forests and grasslands we manage. In order to achieve this, we want information about our lands to be accessible to as large an audience as possible," said David George, Geospatial Service and Technology Center, USDA Forest Service. "We are very pleased that Google has used our geospatial datasets to improve the base map in Google Maps and Google Earth so that everyone can easily discover, navigate and enjoy these public lands." We've also created the Base Map Partner Program to enable organizations with mapping data to contribute their data to Google Maps and Google Earth. This program, like those we've introduced for other map content types, offers organizations with mapping data -- and an interest in making it more visible and useful to internet users -- a straightforward process for adding this data to Google's services. We now provide specifications on the types and formats of base map or "vector" data we welcome, including new roads, housing developments, parcel data, points of interest and bike trails. We hope that organizations with mapping data, such as local governments, regional GIS consortia or real estate developers, will take this opportunity to improve and enrich our base map for their community.